Pink Panther is one of the most iconic characters of our generation. His name is popular in the entertainment industry and is loved by fans of all ages. The character has featured in several TV shows, movies and is now available in your favorite online casino. The Pink Panther slot is a five-reel, 40-pay lines pokies developed by Playtech. The game has six different features and a two-level progressive jackpot from Playtech to add to the dedicated 5,000 coin jackpot. The Pink Panther slot adopts the theme of the original film with the designers settling for a blue and purple colour with slight shades of pink for the buttons. The Pink Panther himself is on the left doing some of his theatrical moves to motivate players and celebrate wins or the start of bonus rounds. The icons in use in this slot game are also adapted from the Pink Panther series. They include Inspector Clouseau, bombs, pots of paint, Little Man, pink paws, magnifying glass, and the classical 10, Jack, King, Queen and Ace icons. Pink Panther uses a maximum of 40 pay lines and can be adjusted to one pay line when combined to different coin denominations on a betting range of 0.01 to $/£/€2000. This range is perhaps the largest range we’ve seen on an online slot making Pink Panther a darling to all budget players and the High rollers alike. Even before we discuss the exciting game features, let me mention that Pink Panther offers the Gamble option. Any win can be gambled in any of these three ways; double half, double all or collect after every round. You will be presented with an opportunity to choose between any of the four cards to try. The second interesting feature that comes with Pink Panther is the Automatic spin option. The button is set to 50, the default, but can be increased, reduced, or stopped at any given time to suit your desire. The Pink Panther not only dances on the sidelines, but he also makes an appearance on the reels. The Pink Panther on the reels plays wild and can be substituted for any other symbol except the scatter symbol. The scatter symbol in the game is the Pink Panther logo. When you land three scatter logos, you will get a 5x multiplier payout and if you make it one better and get 4 logos, you get a 25x multiplier. If you are lucky enough and hit five logos, you get 125x multiplier payout. 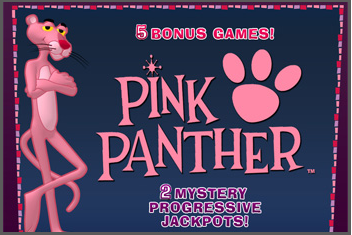 Pink Panther has four different themed bonus games – like mentioned above. Each of the four games is triggered randomly during regular play. There are no combinations or special moves to trigger the bonus games, but it is safe to say the come quite often. In this bonus game, you are required to help Inspector Clouseau locate the Pink Panther Diamond. Inspector Clouseau takes three steps where each successful step awards one prize. You are then expected to discuss whether he should stop or continue. Each progressive step is awarded a bonus prize. When you fall in a trap, you will lose half of your bonus win whilst when you find the Pink Panther Diamond you will double the bonus win. Pink Pow is a crazy feature that indiscriminately blow up 2-6 symbols transforming them into wild symbols. Any other win gained before this is awarded accordingly. Crack the Pink Code game introduces ten locked safes. Each locked safe has multipliers, free spins, or expanding wild symbols. Landing the dynamite means you get blowed up, and the game ends at this point. The free spins and multipliers are activated once the game ends- time to cash in. The color pink bonus game features both the Pink Panther and the Little Man. The two characters paint a wall of numbers. The total sum of the numbers Pink Panthers paints is multiplied by your bet that you can ‘repaint’ to try and double it. The Wheel of Pink bonus round features the Pink Panther himself spinning two wheels. One wheel has cash prize options whilst the other wheel has re-spins or collect icons. The jackpot is also a randomly triggered bonus game. There are four progressive jackpots to choose from; the Major Pink progressive, the Minor Pink progressive or the consolation prize. You’ll be required to choose from twelve closed doors which unveil the Little Man, Pink Panther, or Inspector Clouseau.